He's here. My baby boy is finally here. Friends, meet J. The sweetest little boy that ever there was. He came on my birthday. Pretty awesome birthday present I have to say. I'm enraptured with this little life. Now, for those of you who don't get too squeamish, read on as I'll tell you all about how he entered the world. Labour was pretty good, as these things go. I had light contractions on and off throughout the week, and these got J almost fully engaged and in a great position. Then at about 3.40am on my birthday, I felt a couple of light contractions in bed before my waters broke. Good thing too, because the contractions stayed light and if it wasn't for the waters having broken, I might not have called my support crew in. As it was, Paul rang his Mum, who lives three hours away, and she jumped in the car and headed up to look after L and S. Paul also rang our sister-in-law, Mandy, who lives 15 minutes away, and asked her to look after the girls until Paul's Mum arrived. When Mandy got to our house, my contractions were two minutes apart and lasting about 40 seconds. They still felt pretty light so I spent some time emptying the dishwasher and trying to get things ready at home for Paul's Mum. We finally jumped in the car and that slowed the contractions down. I was thinking, "Oh no, this is a false alarm, I'm going to be wasting a lot of people's time." But after I started walking around at the hospital, the contractions picked up again. 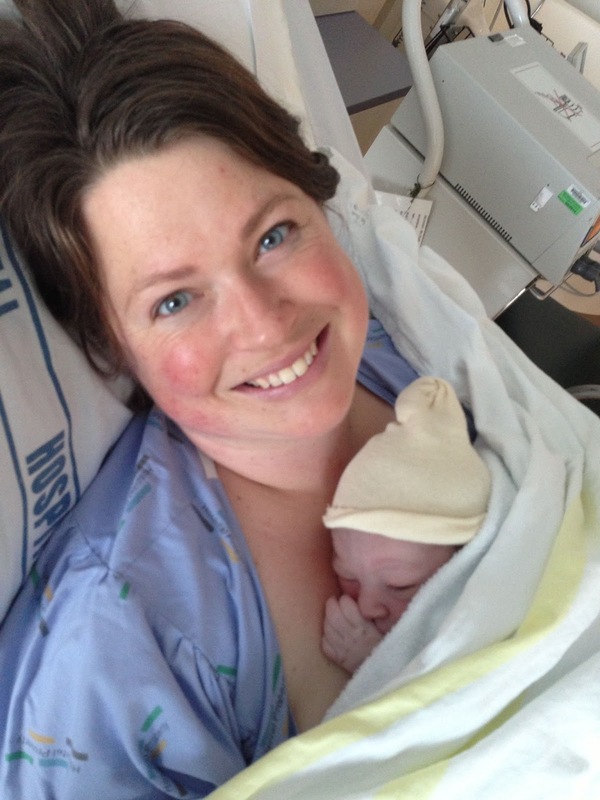 The midwife who delivered J was the one rostered on at the hospital that night. I hadn't met her before, so she was working off the notes my midwife had put together for her. She was a new graduate, and more interventionalist than I would have liked. She lay me on my side and strapped me to the monitor for 10 minutes when I got there, which slowed the contractions down again. When she saw that J's heart rate was dropping with each contraction, she insisted I remain strapped to the monitor. That meant I couldn't have the water birth I was hoping for, and it made it hard to walk around, which is what my body wanted to do for each contraction. For a while I was also feeling quite dizzy and sick so had to lie down, which I could feel was interfering with the work the contractions were trying to do, moving J down. I finally threw up, and after that I felt well enough to get back on my feet for each contraction. While I was labouring, the midwife told me we had a mix up with my paper work. It hadn't all arrived from Wellington and she couldn't find the blood test results which show my immunity to various diseases. This seemed to be a big concern to the midwife, so she spent most of the labour trying to organise someone to put a luer in my arm so she could take blood and get it quickly tested to see what antibodies I had. I really just wanted to get on with labour, wasn't feeling particularly well and didn't like the idea of having blood taken and a luer hanging out of my arm, so I resisted and asked if it was really necessary. I had seen my results and knew they were fine. She tried to convince me the luer would be helpful for more than just taking bloods, saying if I bled a lot she could quickly administer iron through it as well. I finally consented because she seemed so insistent it was necessary, and she went off to get a lab technicion to insert the luer. By the time the lab tech arrived, I was ready to push, so there was no time to insert the luer and I got to avoid it after all. The straps around my stomach holding the monitor in place made each contraction so much more painful. They were digging in in all the wrong places and I finally begged the midwife to take them off. Since I was ready to push out the baby, she consented and got me up on the bed on my hands and knees to deliver. What a relief it was when she undid those straps. Honestly, they were the worst thing about the labour. I pushed really hard to get most of his head out, and was grateful when the midwife told me to stop after a while and give little pushes to get the rest of his head out. I'm sure her advice stopped me from tearing. I gave the little pushes she asked for and his head did come out. I rested with my head on the pillow in front of me until the next contraction came, and then I pushed out the rest of J's body. This was 6.30am. Not quite three hours after my contractions had started. J cried straight away, but I didn't see him for a while as I was still on my hands and knees with my back to him and was just resting with my head on the pillow. Another midwife who had come in the room to help catch J told me she was going to give me a shot of syntocinon in the leg. I couldn't see behind me and I thought it must mean I was bleeding a lot so I said OK. The syntocinon stopped the cord pulsating immediately, so they clamped it, cut it and gave me J to hold. I delivered the placenta shortly after. As I was lying there, holding J, I asked if the injection was for bleeding (that was why I was given one when I delivered L, so that was my only experience with it). The midwife said no, I hadn't bled a drop. It was just to help my uterus contract because sometimes they "freak out" after short labours and don't know what to do. I was upset she had done this as I had wanted the placenta to stop pulsating naturally, so J could get all the important nutrients from the cord blood before he was separated from it. This was something I had specified in the notes my regular midwife put together, so she's going to help me write a tactful letter about it to the delivering midwife, so she will know to check this on her notes in the future. All in all, it was a very easy labour, and would have actually been a lot easier if the midwife hadn't arrived until the pushing stage. I feel like all she did was interfere with a natural process until then. Apparently the fact his heart rate was dropping with each contraction is normal, as it prepares babies to take that first breath when they're born. The time to be concerned is when the heart rate doesn't jump back up after a contraction, or when it's dropping at times when there is no contraction. So all that monitoring was for nothing. Sigh. Thank goodness J was ready to come out no matter what. Well done son! I feel pleased that even without the help of a hot water bath, I managed to give birth without pain medication again. I had told myself I could take Panadol this time, but completely forgot about it once all was go. I did get Paul to put rescue remedy in my water bottle to help calm me. And when things got really painful with the pushing, I found it helpful to pray, "God help me. God help me. God help me." And help me he did. Big sisters meeting their new little bundle. Congratulations on your precious boy!! Well done Emma. Can't believe you are writing posts so soon after. James looks like a rel sweetie. Hope to see you and the family soon. Congratulations. Jodie. Wow. Congratulations. And well done Emma. Lovely for you to have a boy to dress in blue! If James was born before your birth time then he you were still 30. Yay, he was born before my birth time! Win! Congratulations on your beautiful boy! You are such an inspiration. I'm sorry the midwife on duty didn't read your notes thoroughly and clamped his cord early- I can only imagine how disappointing that must have been. I would follow that up until you get a response. Congrats on your wee man - he is all gorgeousness! I giggled at your 'God help me' chant throughout labour, that was mine also - and my labour(s) was fairly quick and pain-free as well... but despite this, I felt this (He) is what kept me going, and focused! Even 'easy' labours are hard work! Love your blog - am a new follower, and so excited to have 'found' you!